By Nishant Soni . Last updated Aug 2, 2013. South Korea based Samsung is a multinational consumer electronics leader whose market share and popularity is escalating in leaps and bounds. With a brilliant range of features, Samsung's top loading and front loading washers are presented in a spectrum of 5 colours: Red, Blue, White, Stainless Platinum and Onyx to suit the ambiance of every home. What's more, the innovative technologies used in Samsung washers renders your whole laundry process much more convenient and simple. Samsung's top loading washers come with different capacities and are typically 4 cu.ft, 4.2 cu.ft and 4.5 cu.ft giving you the option to choose the right size for your family. With a range of features including 9 to 11 wash cycles and 4 spin speeds and models offering up to 1000 rpm, these top loads can be quite a catch, especially as there's an option to program or customize your own wash cycle as well. With the VRT proprietary technology Samsung has also improvised on the noise issue during the spin cycle, so their top loading washers are now quiet enough to be a safe bet even in apartments. Samsung uses what's called a "Diamond drum" which has smaller holes to keep your fabrics intact. And then there's Samsung's very own 'Purecycle' to reckon with. This added benefit makes sure you never need to worry about cleaning out the drum again. 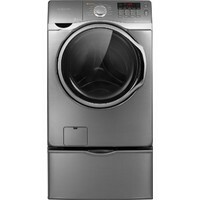 It's an automatic drum cleaning feature that washes away detergent and dirt using hot water. 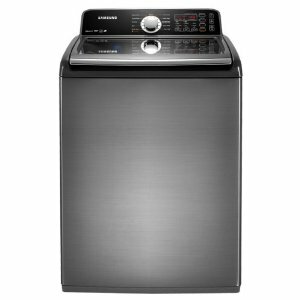 Samsung's front loading washers are more expensive but are also the more popular counterparts with 5 capacity options to select from. With 3.6 cu.ft, 3.9 cu.ft, 4.0 cu.ft 4.3 cu.ft and 4.5 cu.ft options it's a whole lot easier to find something that's the exact size you need. SpeedSpray, the mechanism that jet-shoots water onto your clothes, is the secret to what makes Samsung's front load washers save about 13 minutes during every normal wash cycle, an excellent trick to power conservation. To complement this is 'Powerfoam', another of their very own techniques for tender but more efficient cleansing of thicker fabrics. This is also backed by the steam wash option for more tenacious stains, found currently only in their front loading models. Like their top loading systems, or perhaps better, there is no lack of spin speeds or wash cycles in Samsung front loading washers, offering around 13 wash cycles, a customizable wash cycle and 5 spin speeds including a max speed of about 1300 rpm. Even at such high spin cycles Samsung washers make as little sound as possible, so it's now quite alright to have it running even at night. With all the benefits mentioned above there are other amenities to like delay options of up to 24 hours, but as is the case with anything in life, fancy features are going to tweak your pocket, so take a minute to think about how many of these frills you actually require. 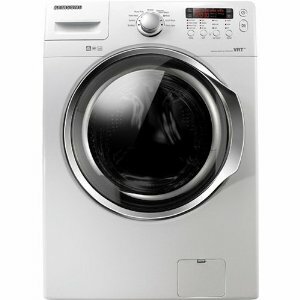 Once you know what you want, scroll down our list below of the best Samsung washers to get a good idea of what's out there and then check out our buying options for you. 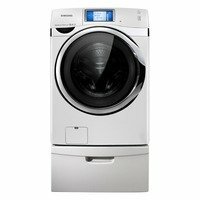 Product Features Control and Monitor the Washer from your Smartphone with Smart Control- An 8-inch Touch Screen LCD makes it easier to select the right cycle and monitor wash time. The Smart Control app on your smartphone allows you to remotely start the washer and notifies you when your laundry is done, Thoroughly Washes Even Big Loads with PowerFoam- Exclusive PowerFoam washer creates a powerful, yet gentle foam than easily penetrates through fabrics. Confidently wash large, bulky items like king-size comforters in just one load. 4.5 Cu. Ft. Washing Capacity, Aqua Jet Washing System, SmartCare Built-In User Manuel Samsung 4.3 Cu. 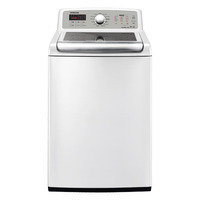 Ft. 9-Cycle Ultra Capacity Washer Wash fabrics in peace and quiet with this washer featuring Vibration Reduction Technology, The allergen and sanitation cycles ensure your clothes are thoroughly cleaned.